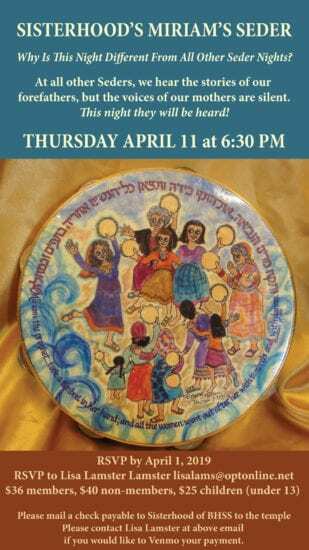 Note: there will be no Erev Shabbat service on Friday, April 19; that evening is also Erev Passover, the first seder. As it says in the Haggadah, “Let all those who are hungry, enter and eat.” If you have room at your seder table or need a place to go, please call the synagogue office at 201-512-1983 or write to [email protected]. For our schedule of Passover services, click here. 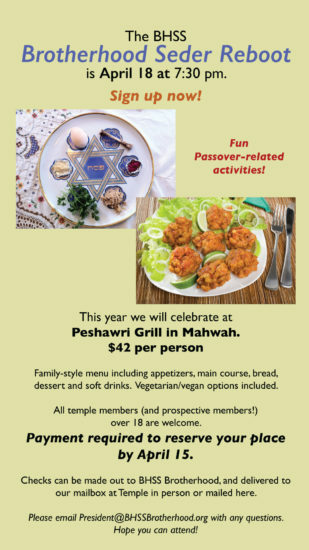 Looking for some new Passover recipes, like brisket and gluten-free or vegan matzah balls – recipes to make with your children or grandchildren, along with some more traditional recipes? Click here! Want more? Click here to find our Library Ladies’ “Taste of Passover” Recipe booklets! 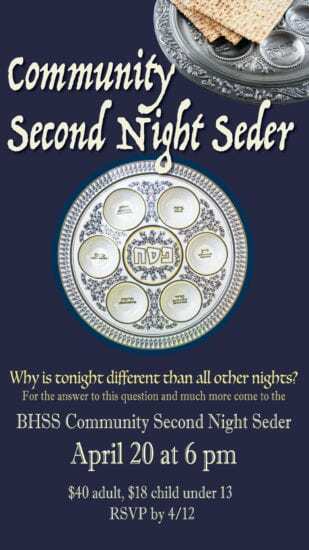 Once again, BHSS is hosting a community second seder, by RSVP only. See the flyer below for details. RSVP by calling the office at 201-512-1983 to reserve your seats with your payment. And… Join our Brotherhood or Sisterhood ~ Bring your sons, daughter, brothers, sisters! For Questions and to RSVP, click here: [email protected] Mail or drop off your check to the synagogue. Join us as Rabbi Ilana leads our Seder! For Questions and to RSVP, click here: [email protected] Mail or drop off your check to the synagogue.